While I don't collect Everyday Food the way I collect Martha Stewart Living magazine, I do have a small drawer in a kitchen cabinet devoted to the best issues of this informative little digest. I've been a subscriber since the magazine began in 2003 and I've saved the issues I find the most helpful - the ones I turn to most often for recipes, tips and techniques. I am not a born cook. I don't have the natural flare my father has to dream up new concoctions and problem-solve in the kitchen, nor my mother's patience in making beautiful, multi-course holiday meals. Everyday Food was crafted for people like me: interested in preparing good food with not a lot of time or natural-born talent. The April, 2012, issue is one that is going into the archives. It is the 'how-to' issue, filled with advice and secrets for achieving success at mealtime. There are Easter and Passover recipes as well as daily kitchen tips. 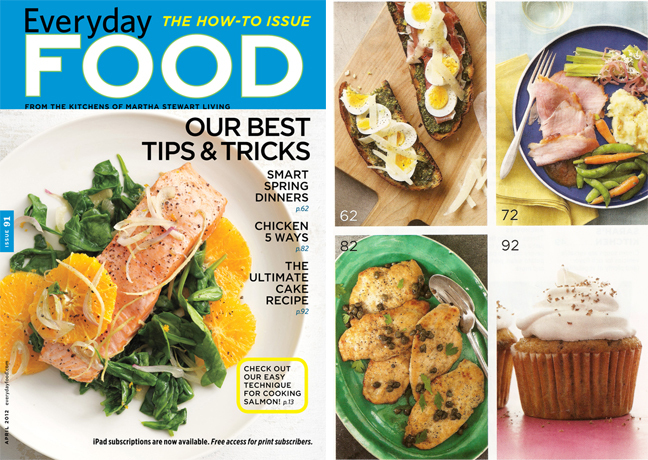 The best-selling feature of this particular issue is a piece about the most foolproof, versatile yellow cake batter. I've transcribed the essentials below. It's sure to become my go-to recipe whenever I'm required (or inspired!) to bake a cake. Bring cold ingredients to room temperature. Butter should be soft enough to hold a thumb print but still keep its shape. In a large bowl, using an electric mixer, beat the butter and sugar on high until light and fluffy, about six minutes. Beat in the eggs and the egg yolks one at a time until combined. Beat in the vanilla. In another bowl, mix the dry ingredients, whisking to combine. With the mixer on low, add 1/3 of the flour mixture to the butter mixture, beating to combine. Beat in 3/4 cup buttermilk, another 1/3 of the flour mixture and another 3/4 cup of buttermilk, and remaining flour mixture until just combined. Scrape down the bowl as needed. The recipe makes a variety of cake desserts. 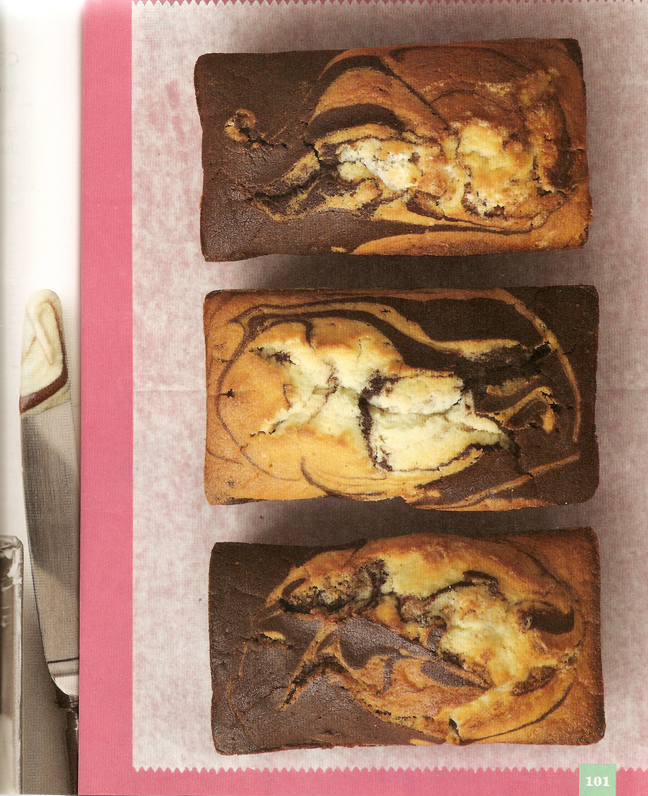 The magazine provides four delicious examples: Raspberry Cream Layer Cake, Pineapple Buckle, Cappuccino-Chocolate Cupcakes and Chocolate-Vanilla Marble Cakes, shown below. I want to know baking directions for the yellow cake just as it is. Anonymous, the 'imitation' error was mine, not the editors. 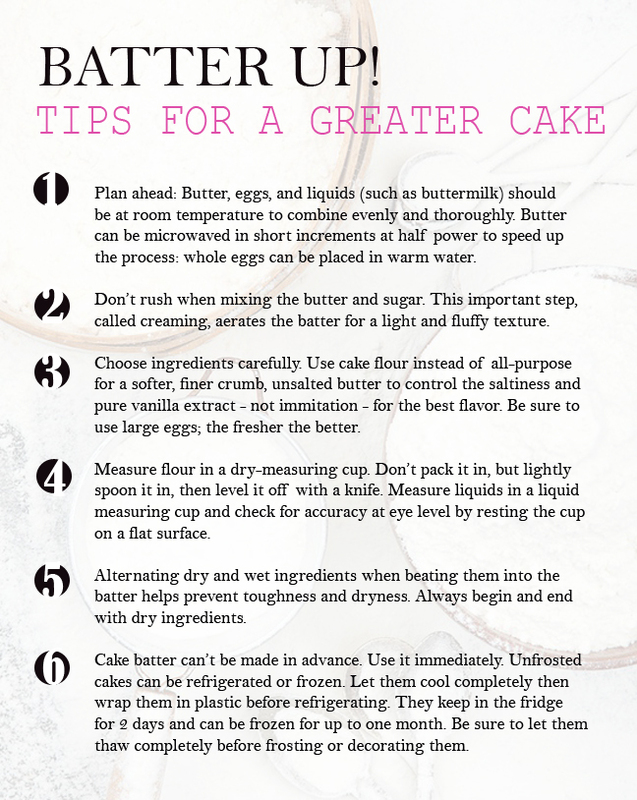 I made that page you see on the blog with the cake batter instructions. Ooops!